It’s not often a small business of any kind makes it to its 50th year—even family businesses face challenges to persist in today’s market. But Burl-Moor-Driben Animal Hospital is an exception. Its owners embrace innovation without sacrificing tradition, and maintain a passion about what they do every day. Their dedication and hard work has paid off. This month the practice, owned and operated continuously by the Driben family, will celebrate 50 years of business in Moorestown. In 1967 Dr. Charles Driben was looking for a place to relocate his veterinary practice in this area, and jumped at the chance to purchase the Burl-Moor Veterinary Clinic when it went on the market in May of that year. In those days the practice focused on large animals and was located in a single building surrounded by fields on the western edge of Moorestown. Dr. Driben added his own name to the fledgling business, and Burl-Moor-Driben (BMD) evolved into a practice specializing in household pets, although the occasional horse or even exotic animal required his care through the years. Eventually the business outgrew the single building, and multiple add-ons made it possible to accommodate the practice’s expanding clientele. In addition to broadening its animal health care capabilities, BMD offered boarding kennel services, and professional and technical staff was added to fill these needs. Most of Dr. Driben’s four children assisted in the kennel and his wife helped run the front office, setting the stage for BMD to evolve into a family business. Dr. Driben’s youngest son Ian went on to become a successful businessman and was working toward his master’s degree in business administration, but hadn’t yet settled on a specific field. When his father asked if he would consider veterinary school instead, Ian realized that his heart was in the practice his father had built and where he’d essentially grown up. Instead of finishing his MBA, he enrolled in the University of Pennsylvania Veterinary School where his father had trained, and in 2005 became the second Dr. Driben at BMD. His business background was a great asset in helping to manage and improve that side of the enterprise, and he also brought with him the most recent veterinary advances. Together they continued to expand the legacy business, each providing specific insight and skills. Today BMD has six veterinarians and a staff of thirty offering services for a wide variety of routine and more advanced animal health care, including: soft tissue and orthopedic surgery, behavior and nutrition counseling, advanced dental care, ultrasounds and echocardiograms, allergy and dermatologic work-ups, internal medicine and endocrinopathy management, and chemotherapy as well. Instead of a predetermined vaccination program, BMD utilizes vaccine antibody titer testing, a cutting edge protocol that measures a pet’s responses to prior vaccines to help determine the necessity of boostering certain vaccines. “Every patient in here is an individual,” the doctors note. “We don’t do cookie-cutter medicine.” The hospital is able to provide these extra services through a multi-faceted approach involving ongoing continuing education, hands-on wet labs, and their close working relationships with the best board certified specialists in the area, which include daily consults and personalized on-site training. If your pet’s health requires more specialized care, then BMD can seamlessly coordinate with these various local specialty hospitals to provide your pet with the best help and ongoing continuity of care and communication. As much as the staff at BMD love working with animals, they also pay particular attention to each pet’s ‘family’. The doctors spend a lot of time with pet owners going over every detail of care and answering all questions. “It’s very important to make that connection,” say the Dribens. “We make an effort to build trust and relationships.” Their emphasis on personal attention and top-notch care is evident in the thriving practice, which provides service for hundreds of animals each week. The Dribens are also seeing the children of many of the practice’s early clients who wouldn’t think of going anywhere else for their pets’ health care—even if it means driving quite a distance. Widely respected in the field, BMD was recently reaccredited by the American Animal Hospital Association, which only recognizes 15 percent of all animal hospitals in North America. Ian Driben recently served as president and was a member of the executive board of the New Jersey Veterinary Medical Association (like his father who had served in both positions in the past) and currently serves on the University of Pennsylvania School of Veterinary Medicine Dean’s Alumni Council. The doctors also make an effort to share their skills and knowledge with the community through rabies clinics, career days, tours for scouts, skill-building job experiences, and working with satellite school programs to help student development. Throughout all of these efforts, the Dribens’ emphasis has been to educate people on the value of animals. 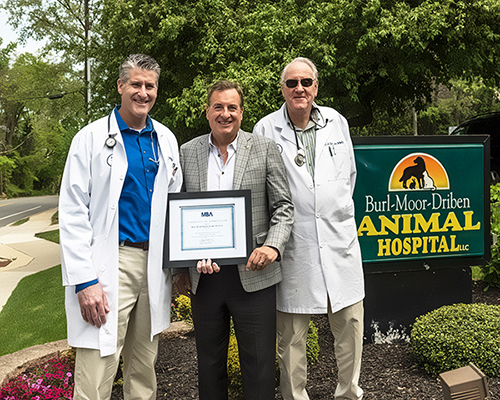 Moorestown Business Association is pleased to recognize Burl-Moor-Driben Animal Hospital as it celebrates its 50th anniversary as a leader in veterinary medicine in the region, and as a cornerstone business that helps make the Moorestown community exceptional.